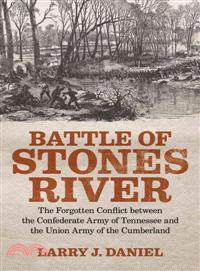 Three days of savage and bloody fighting between Confederate and Union troops at Stones River in Middle Tennessee ended with nearly 25,000 casualties but no clear victor. The staggering number of killed or wounded equaled the losses suffered in the well-known Battle of Shiloh. Using previously neglected sources, Larry J. Daniel rescues this important campaign from obscurity. The Battle of Stones River, fought between December 31, 1862, and January 2, 1863, was a tactical draw but proved to be a strategic northern victory. According to Daniel, Union defeats in late 1862 both at Chickasaw Bayou in Mississippi and at Fredericksburg, Virginia transformed the clash in Tennessee into a much-needed morale booster for the North. Daniel s study of the battle s two antagonists, William S. Rosecrans for the Union Army of the Cumberland and Braxton Bragg for the Confederate Army of Tennessee, presents contrasts in leadership and a series of missteps. Union soldiers liked Rosecrans s personable nature, whereas Bragg acquired a reputation as antisocial and suspicious. Rosecrans had won his previous battle at Corinth, and Bragg had failed at the recent Kentucky Campaign. But despite Rosecrans s apparent advantage, both commanders made serious mistakes. With only a few hundred yards separating the lines, Rosecrans allowed Confederates to surprise and route his right ring. Eventually, Union pressure forced Bragg to launch a division-size attack, a disastrous move. Neither side could claim victory on the battlefield. In the aftermath of the bloody conflict, Union commanders and northern newspapers portrayed the stalemate as a victory, bolstering confidence in the Lincoln administration and dimming the prospects for the peace wing of the northern Democratic Party. In the South, the deadlock led to continued bickering in the Confederate western high command and scorn for Braxton Bragg. Larry J. Daniel is the author or coauthor of six books on the American Civil War, including Days of Glory: The Army of the Cumberland, 1861--1865.